In a large bowl, cream together the butter, brown sugar, egg and vanilla until smooth. In a separate bowl, whisk the flour, baking soda, cinnamon and salt together. Stir this into the butter/sugar mixture. 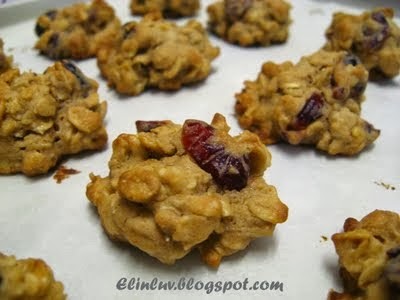 Stir in the oats, raisins ( dried cranberries) and walnuts and baileys, if using them. At this point you can either chill the dough for a bit in the fridge and then scoop it, or scoop the cookies onto a sheet and then chill the whole tray before baking them. 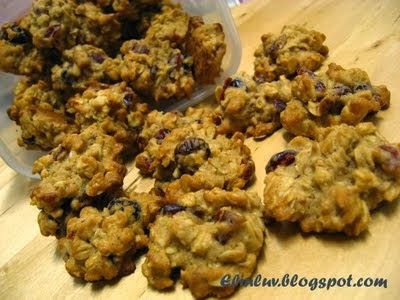 You could also bake them right away, if you’re impatient, but I do find that they end up slighly less thick.